Reactions to most horror films usually don't cause dancing, especially to a song with quirky lyrics that celebrate the monster. But in The Blob (1958), that is exactly what I found myself doing, moving to a Latin beat with these lyrics written by Burt Bacharach and Hal David: "It creeps, and leaps, and slides and glides, across the floor, right through, the door, and all around the wall, a splotch, a blotch, beware of The Blob." But it's hard not to celebrate the allure of this amorphous creature, which has become uniquely entrenched in American popular culture in a manner similar to other monster archetypes such as Dracula, Frankenstein, and King Kong. How often have you heard something unidentifiable called a "blob"? More times than I care to admit. Watching this film is surreal and like watching two films rolled into one script. The first deals with the actual blob, a gelatinous, hungry monster from outer space consuming everything in its path. The creature terrorizes a prototypical 1950s middle-America town during the course of one evening only to be defeated by the combined efforts of the public, local teenagers, and cops. The second deals with the conflict between the local teenagers and the "establishment," which is portrayed best by the police, who refuse to believe the teenagers' cries for help. Therefore, in a sense, the film is a funky hybrid of War of the Worlds (1953) and Rebel Without A Cause (1955). Steve McQueen plays Steve Andrews, who is necking with his girl, Janet Martin, played by Aneta Coursaut. A meteor crashes in the woods a few miles away and an old man investigates the hole. An orb-like piece of debris opens and the old man explores its contents. Of course, the gooey blob attacks his hand and he runs away only to be picked up minutes later by the young couple. They bring him to the local doctor, Dr. T. Hallen, and the blob takes over. It wreaks havoc on Hallen's office and the town. Andrews and Martin plead their case to local police, but their parents and the authorities want nothing to do with their perceived mischief. Later, when the couple encounters the blob, it traps them but mysteriously leaves and slides away toward the local theater. It flushes the theater's occupants into the main street and corners patrons in a local diner. Andrews and the police realize the reason the blob originally left them alone, so they fetch the appropriate weapons from the local high school and neutralize it. The final scene cuts to a parachute dumping the blob in an icy region reminiscent of the North Pole. This is where the 1972 sequel directed by Larry Hagman (yes of J.R./Dallas fame) titled Beware! The Blob begins. A technician brings home a frozen sample of something, and when his wife lets it melt, the blob returns. 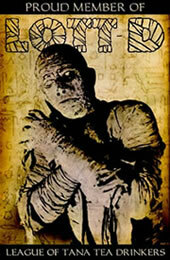 In Hagman's sequel, both horror and comedy intertwine to form a cultish surprise. A 1988 remake under the same title as the original also emerged. But neither compare to the unpretentious seriousness of the original. The latter two are self-conscious. The original is a worthwhile journey in horror-science fiction cross pollination whose serious themes emerge innocently and with splashes of humor. The blob comes from outer space and is one "blob" on the matrix of films during the 1950s that try to warn us of the potential dangers of space travel. But because we have no idea what it is or where it came from, we must identify with it and define it. And it is these fundamental connections viewers make with the blob that draw them to it so intimately. Furthermore, because the blob is faceless, viewers can more easily ostracize and celebrate it because they inevitably project their own fears and anxieties on to this jellyroll of monsters. As the drama unfolds, the teenagers of the town clearly project their angst onto the blob. In fact, the monster becomes their salvation. At one point, Andrews says the cops "will have to believe us" when the kids report their observations about the blob. This is their chance for redemption. The blob and teenagers' identities merge, and this merger is exemplified by many things, most noticeably the color of their cars. This color, a bright burgundy, is the same color as the blob. What other entity symbolizes the identity of 1950s teenagers than their car? Their identities are fundamentally one in the same. And as the blob grows, so does Andrews's persuasive abilities. By the end of the film, the entire town is carefully listening to him, ready to start a mob riot against the monster. Throughout the film, it is difficult to know who the real enemy is: the teenagers and their representative, Andrews, or the blob. This is evident when we see mostly teenagers in the theater watching horror flicks. They can easily identify with ostracized and demonized creatures. Furthermore, it is no coincidence that the ultimate solution for destroying the monster, the fire extinguishers, is found in a high school. Perhaps the young ones do have some reasonable alternatives. The film does a wonderful job of conveying this theme. In addition, one must wonder if the blob itself represents a criticism of the 1950s in general. One such criticism was the emerging consumer culture of 1950s America. 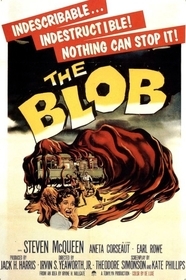 After emerging in the field and doctor's office, the blob primarily strikes in consumer-oriented places: the movie theater, diner, and grocery store. Subsequently, the blob seems intent not only on destroying the consumers in those locations, but the locations themselves. This is a curiously sophisticated motif for a film that is often relegated as a B-movie landmark. Another criticism of that decade was the mob psychology of the early 1950s that fueled McCarthyism and the fear of Communism. The blob is literally an unidentifiable creature that feeds and expands on individuals' fears. One could say the same thing about the targets of Senator Joseph McCarthy's "red scare" accusations. Shot in various locations throughout Chester County, Pennsylvania, this film is today a cult classic that laid the groundwork for many independent horror films, many of which emerged only a decade later such as Night of the Living Dead (1968). At times the film is frightening, at times it is mysterious, and at other times it is surreal. But all of these impressions lie in the fact that such a diminutive film could carry such political and cultural weight. And clearly, the horror in this film is not only restricted to the plot. What is truly horrific about this film are the lessons it can teach us about ourselves and our strengths and weaknesses as members of the human race. During the theatre scene, the movie being shown was Dementia (aka Daughter of Horror), a low-budget flick that had no dialogue save for narration by Ed McMahon. Submitted by Mr. Y (not verified) on Wed, 2011-04-20 16:47.
you should mention how the blob turns more red after consuming each victim, the power lines on the diner, and being trapped in the freezer. they are good bits of info to know, and they don't reveal any more spoilers than you did when mentioning CO2.